Hit C-c C-c to evaluate the source block. Hit C-c C-v C-t to put the expanded code into the file noweb-test.py. Add :results output to the #+begin_src line of the second block to see the print results under that block when you hit C-c C-c in the block. You can also use properties of headlines for giving the noweb-ref. 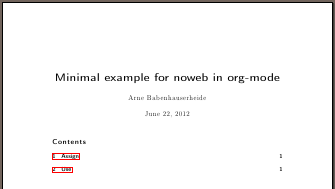 Org-mode can then even concatenate several source blocks into one noweb reference. Just hit C-c C-x p to set a property (or use M-x org-set-property), then set noweb-ref to the name you want to use to embed all blocks under this heading together. Note: org-babel prefixes each line of an included code-block with the prefix used for the reference (here <<assign_abc>>). This way you can easily include blocks inside python functions. Note: To keep noweb-references literally in the output or similar, have a look at the different options to :noweb. Have fun with Emacs and org-mode!